Already recognized in the transportation industry for its success in natural gas engines for light-, medium-, and heavy-duty vehicles, Westport Innovations is making further inroads into high horsepower by teaming up with Progress Rail Services’ subsidiary, Electro-Motive Diesel (EMD), a diesel-electric locomotive manufacturer, in its demonstration program with Canadian National Railway (CN) and Gaz Metro. The project will demonstrate the effectiveness of Westport high-pressure direct injection (HPDI) technology for rail transportation using natural gas as fuel. 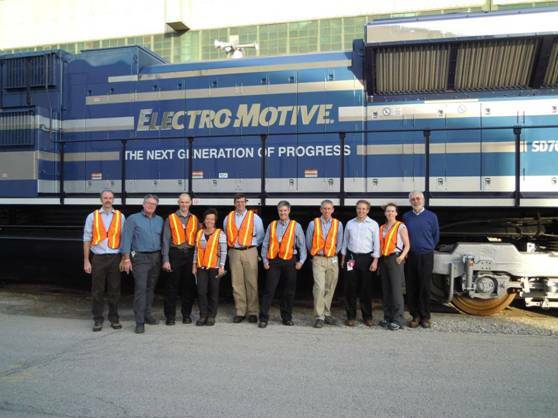 EMD’s participation, announced today, is an important endorsement for Westport’s strategy and EMD’s commitment to reducing its impact on the environment, whether through low-emission freight repowers and new diesel locomotives, or alternative fuel efficiency projects such as the demonstration program with Westport and CN. The aim is to develop a CN locomotive powered by an EMD engine equipped with a Westport HPDI fuel system pulling trains in Quebec and refuelled by Gaz Metro. So, why the sudden increase in attention from rail about shifting tracks to natural gas? Have you seen the announcement from Shell outlining its intention to engage with rail original equipment manufacturers (OEMs)? What is becoming clear from the goods movement industry are the competing forces between rail and trucking. i.e. if the trucking industry decides to shift their primary fuel to natural gas / liquefied natural gas (LNG) and thus helping reduce their operating cost—rail must follow. As a competing solution to trucking, even a small shift in the ‘balance of power’ from rail to trucking can be economically damaging. Westport, happy to help either industry progress the use of natural gas engines, is working with three of the top four global engine manufacturers and seven of the top ten vehicle manufacturers. A locomotive can burn up to 400,000 gallons of fuel per year. If the locomotive industry is able is able to save $1.00 per diesel gallon equivalent or perhaps $1.50 per gallon, the economic implications are startling. Long term success of natural gas mainline rail operations in North America will require a tender car coupled to the locomotive for refuelling. As part of the initiative, Westport will be developing the critical components for a tender car and testing that part of the system at Gaz Metro’s facility in Montreal. With this new project, Westport is building on its growing high horsepower capabilities. Earlier this year, an agreement with Caterpillar launched an evaluation of HPDI for their large engines which are used in mine trucks, boats and other industrial applications. According to the United Nations Statistics Division, railroads around the world burn nine billion gallons of diesel fuel annually, largely in transporting freight. The development of natural gas fuelled locomotives will dramatically reduce the cost of transporting the world’s primary resources and manufactured goods because of the low cost of LNG compared with diesel fuel. HPDI rail engines burning natural gas also have the potential to reduce emissions considerably, an important goal as emissions regulations become more strict. The use of natural gas reduces greenhouse gas (GHG) emissions by up to 27%. Converting a single locomotive to liquid natural gas fuel is the equivalent of converting 20 long-haul tractor-trailer trucks to LNG in its GHG reduction. This project has been made possible through a $2.3 million funding commitment from the federal non-profit corporation Sustainable Development Technology Canada (SDTC), which will allow Westport to continue research and development of new green technology.